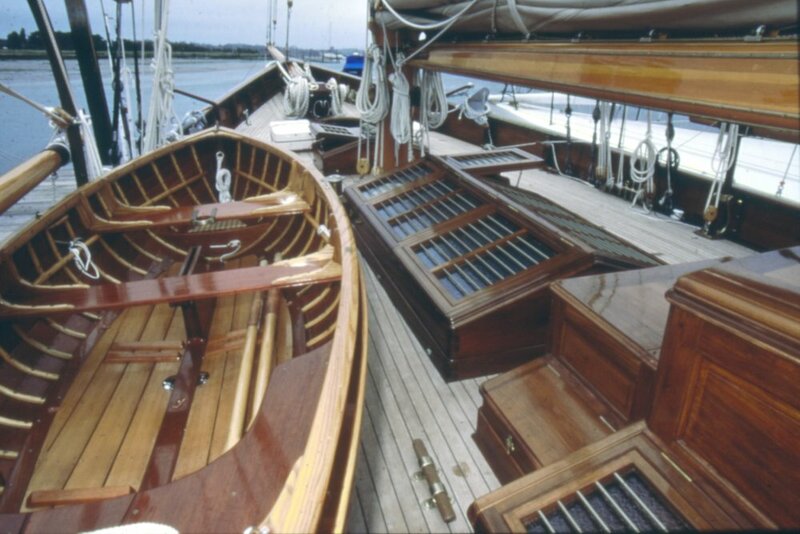 We have been proudly restoring yachts for over 26 years, during this time we have gained a reputation for our traditional approach to structural restoration, beautiful high quality joinery and the sympathetic inclusion of modern systems. Twenty yachts (and counting) from 24 ft. to 95 ft. have been restored at our waterside Hamble facilities. 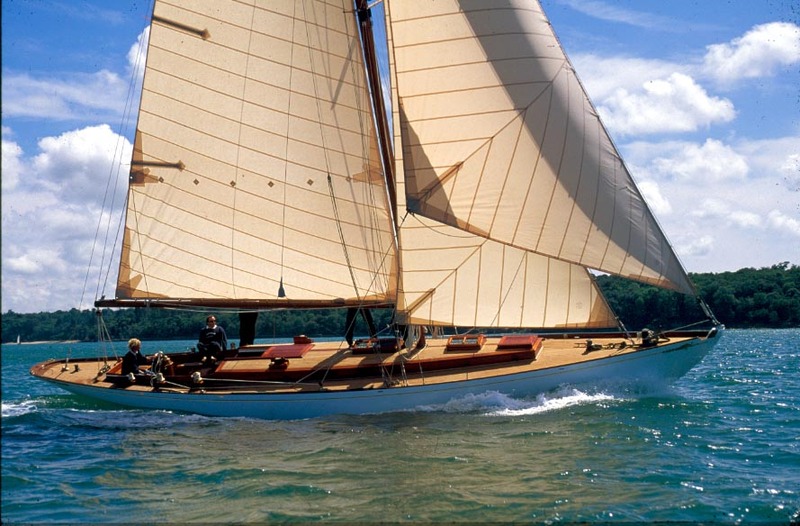 Fairlie have concentrated on the yachts designed by William Fife and are acknowledged as the World leaders in the restoration of these beautiful yachts and are custodians of the Fife Design Archive of over 500 yachts. The hallmark of a superb restoration, is when one can't see it has been restored. Our attention to detail has led us to use original iron fittings as foundry patterns to cast exact replicas in bronze. Similarly, down below, old fittings have been reused to fabricate items which although new and perhaps made from better materials will look and feel as though they came from the right period. We worked with a UK Owner to find a competitive eight metre racing yacht. We visited three yachts around Europe before selecting Helen. After changing a couple planks before the first season the entire centreline structure was replaced, floors replaced, generally strengtheningup this eighty year oldlady. A light weight cockpit was fitted allowing the replacement of some weight back into the keel. 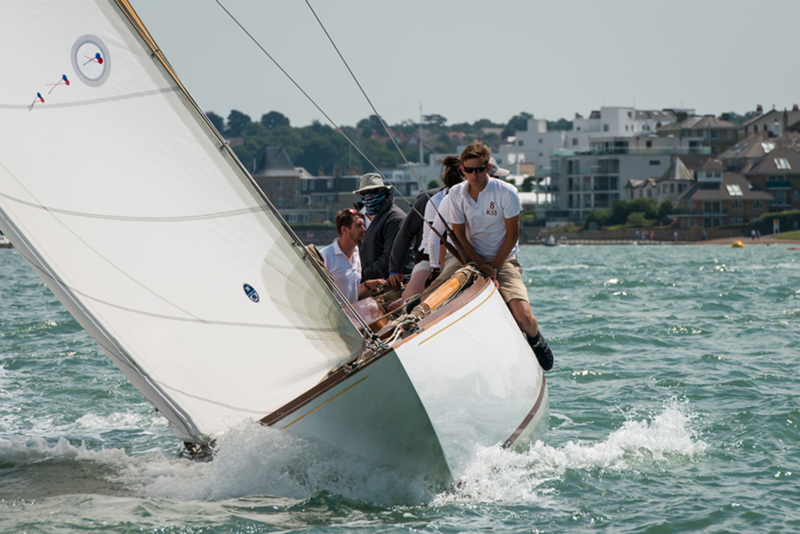 This third rule yacht competes regularly in the Uk classic regatta and the European 8M championships. We first came across this fast second rule metre boat in Vancouver in 2008, we had been sent there by a prospective UK client to look over the four eight metres in the area. Falcon went first to Newport where most of the restoration was carried out. Fairlie finished off the planking, fitted a new deck and interior. 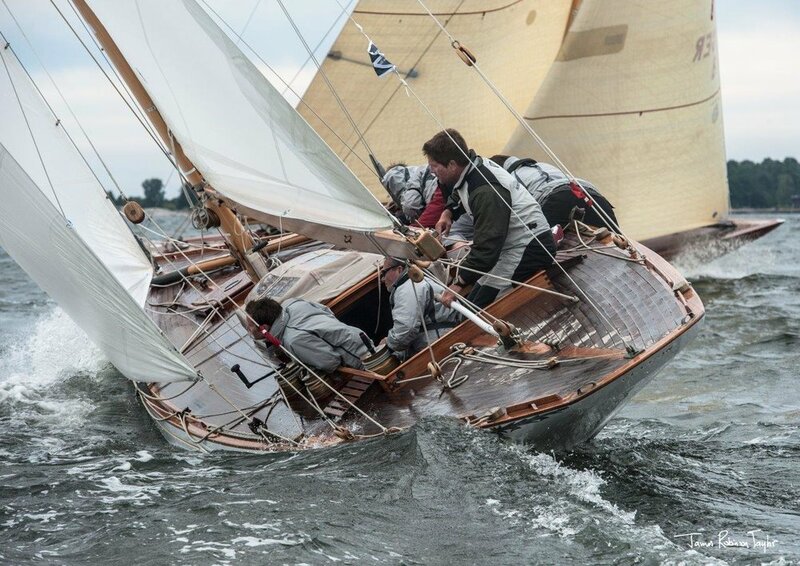 The current Dutch owner and crew sail her hard with great success, winning the Neptune trophy in 2013. This beautiful 24 ft. yacht arrived on the back of a lorry. One of four 24ft ‘Saint’ yachts built for returning service men. Unusually this yacht has a centreplate passing through the lead ballast keel. When we discovered discrepancies in the shape of the yacht the current owners un-earthed interesting correspondence between the designer and builder, resulting in Fife changing the shape in the forward sections of the yacht. 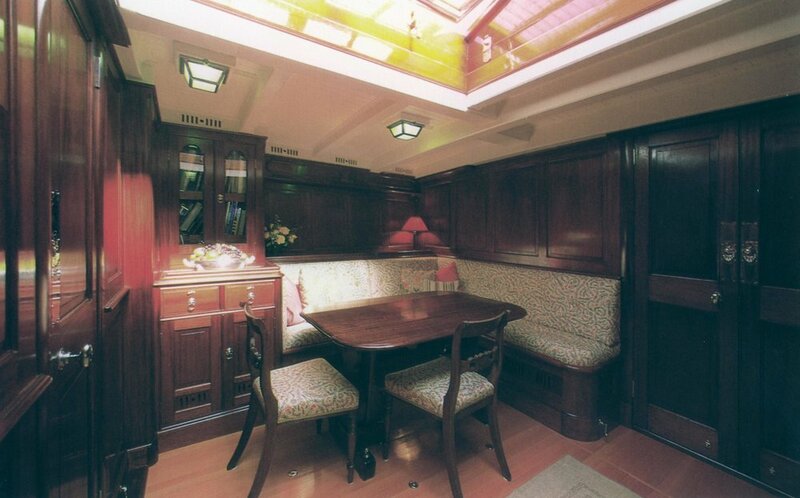 This is the only yacht we have restored using the ‘Fife’ close seaming method of caulking. Restored over 3 winters, whilst sailed in the summers during, 2009, 2010, 2011. 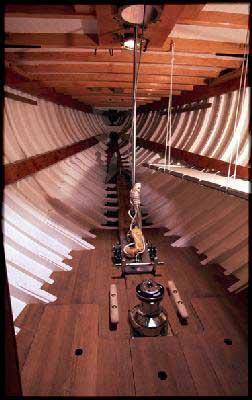 This 60 ft LOD gaff cutter arrived in spring of 2009 having had many changes made to her over the years. Over three winters we carried out a major weight reduction exercise, replaced the long coachouse with originally styled skylights, new centreline structure, new swept teak deck, new panelled interior. She is now a successful competitor equally at home in the Mediterranean or the classic regattas in the UK. This beautiful Bermudan cutter had for many years suffered from severe leaking, following the Fife Regatta in 2008 she came to Fairlie to have a long standing structural issue successfully sorted out. 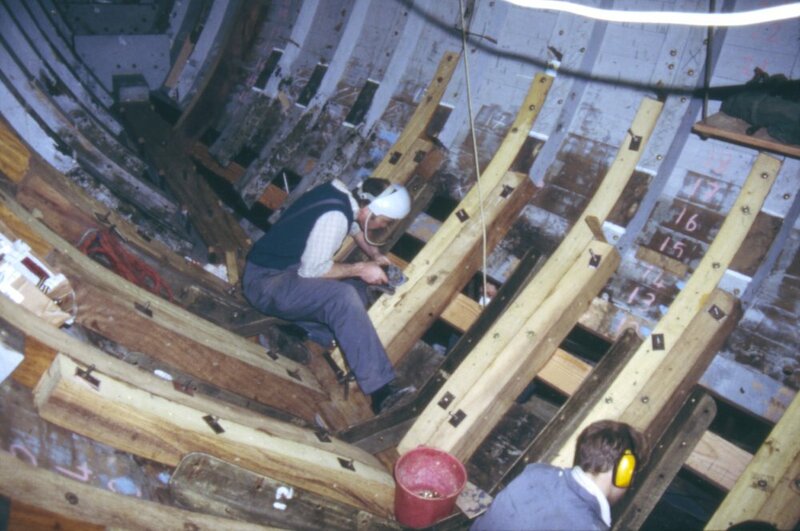 Our work involved the removal of the lead keel, restoring the plate and strap floors and new centreline fastenings. Halloween remains a strong competitor racing on the Mediterranean circuit. I went to Stockholm in the early noughties for a trial sail. Fairlie bought the yacht and kept her in stock until purchased by a European client in early 2007. 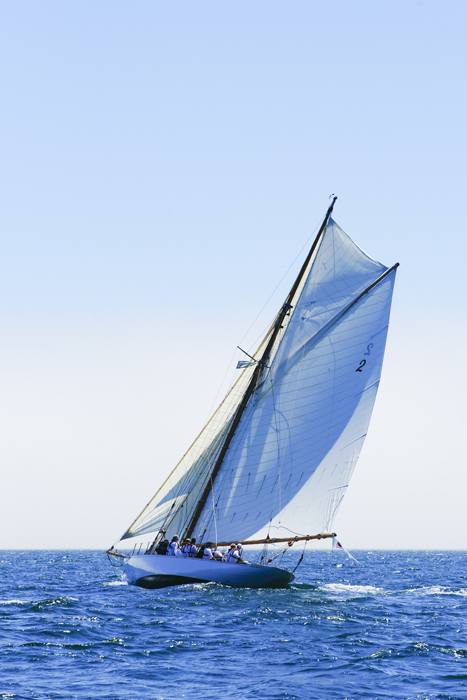 Over her long career the yacht had undergone many changes, sloop rig and an altered and lowered keel. All the changes were reversed and the yacht was returned to her original specification, including the steel frames. A small Yanmar engine was added and a few sailing instruments. She now lives on Lake Constance. This European owned yacht came to us to solve some interesting structural issues and to have an extensive interior ‘spruce up’. The structural issue centred around a previous restoration, an error made then which although might seem trivial had major implications. We also carried out work in re-bolting bulwarks. The internal furniture, then twenty years old was carefully dismantled, stripped and refinished. A new scrubbed teak sole was fitted in the interior. With Harry Spencer and Dr. William Collier, Fairlie carefully lifted the yacht out of the Essex mud and took her to Hamble where she awaited the Foundacion de Hispania instructions. 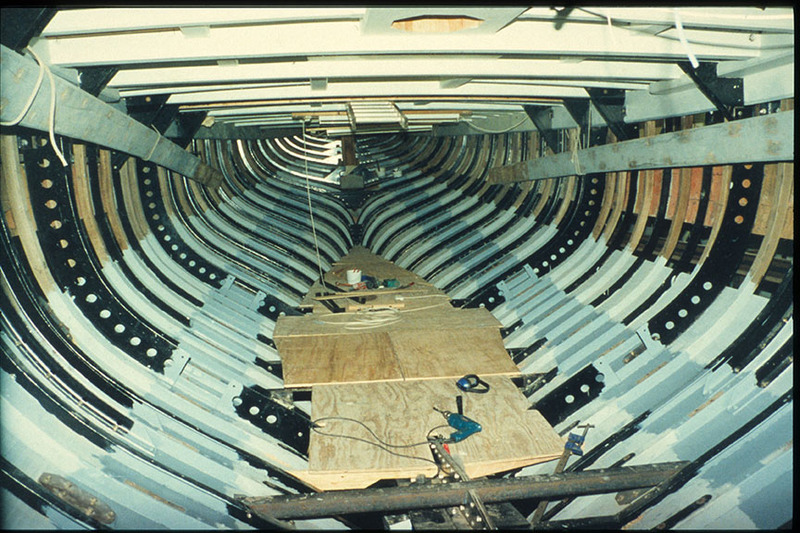 In 2004 work started in completely rebuilding the hull and deck. Once complete the yachts was put on a ship to Mallorca where the restoration was completed. 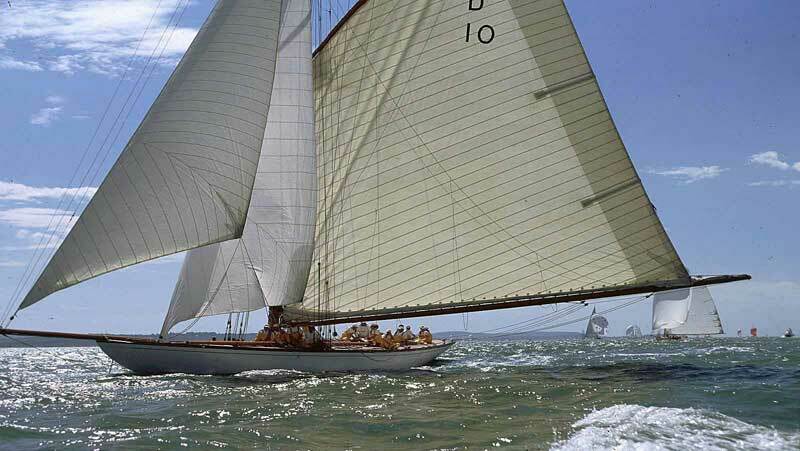 She has since been raced throughout the Mediterranean Classic Regattas. Duncan was part of the original restoration at SYS in 1986/7. 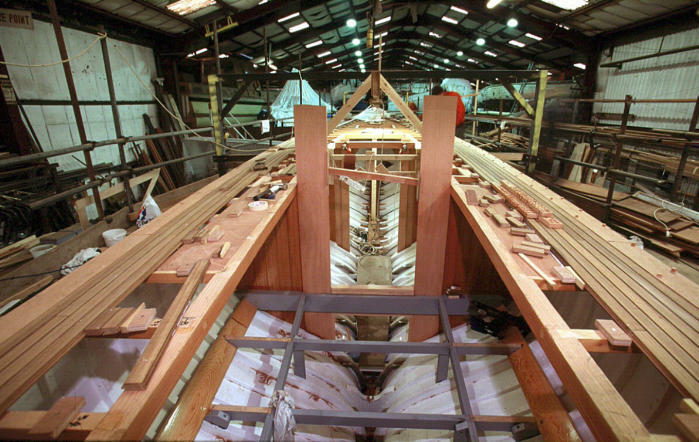 In 2004, with a Lloyds special service due, the skipper brought the yacht back to Fairlie and many of the team from the original restoration team who now worked with Fairlie. Work involved renewing part of the stem, a great deal of engineering work, including upgrading the air conditioning and refrigeration, spar work etc. In 1991 with Harry Spencer and aided by Dr. William Collier a small team from Fairlie rescued her from her mudberth at Pin Mill and brought her to Hamble to await a new owner. Mariquita is quite unique in that so much of the original furniture still existed. One paragraph can not accurately tell of the adventure we all took part in, finishing with the launch in march 2004. 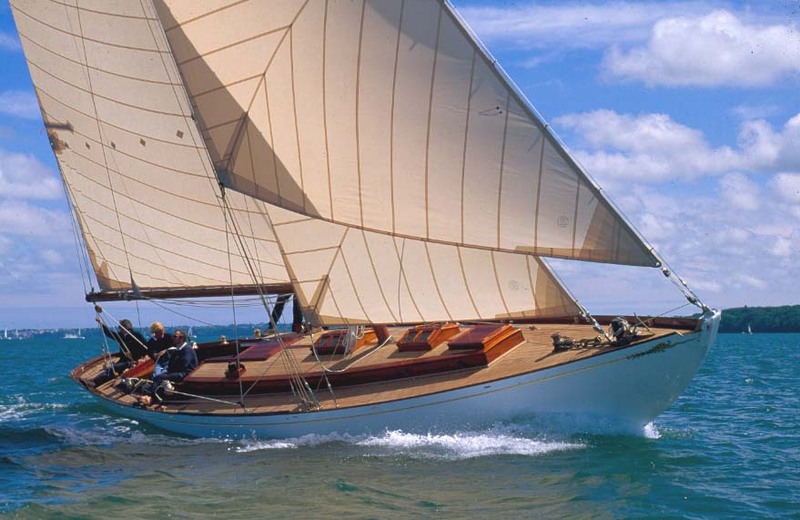 Since her restoration Mariquita has been a active participant in Mediterranean and UK classic regattas. 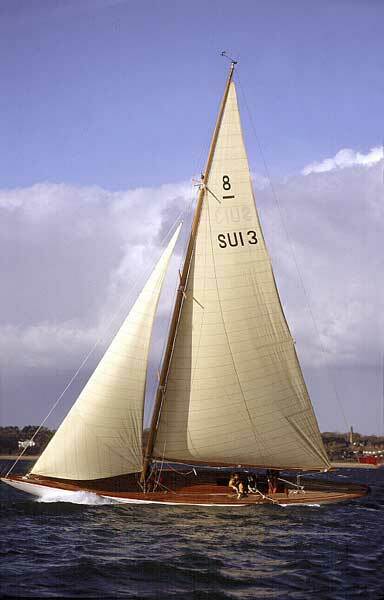 This small gaff cutter (30ft LOD) has given more enjoyment to her Owners’ and their friends than any other restoration we have carried out. In spite of her great age we managed to save most of the back bone, little else had survived the long passage of time. This yacht lives in a 40ft shipping container, where the humidity introduced into the sealed box has keep her in superb condition whether stored in the south of France or in the UK. 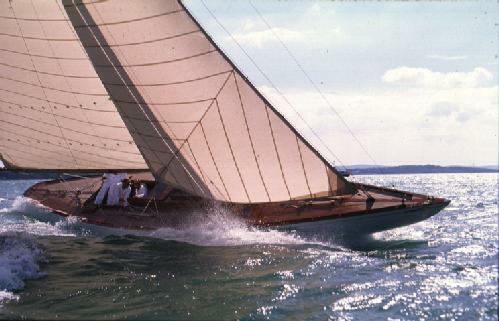 This beautiful yacht, owned by a UK business woman, was restored to her original glory in Hamble and has raced competitively ever since. This restoration involved much research to work out the designer’s intentions and build her as original. Duncanwas part of her crew in the 2000 European world championships, and got to meet Olin Stephens. By 1998 the racing on the gaff cutters had become more serious. Although we fitted an engine, the ‘A’ bracket propeller and shaft are easily removed. The fuel tanks are aircraft quality flexi tanks. Sadly the original interior was un-usable, so we build the interior practically as original but in European walnut, including a corridor of high wide panels. The Lady Anne’s battles with the other three 15m class members are legendary and usually successful, finishing near the top of the class. This yacht arrived on a ship from the USA, allegedly just needing a new deck and tidy up. Sadly within a day of arrival it was found that the wood keel was rotten, so the scope of work also included a new keel sternpost and knee. We fitted an electric drive system to the yacht, as she lives on lake Geneva range is not a problem. I took her out a few time in Hamble and the motor proved to be very impressive, especially the ability to stop quickly. The yacht still competes regularly in the 8 Metre championships. This yacht had undergone some interesting modifications before brought to us by her new Spanish owner. She was at some stage sheathed in glass and the interior structure sandblasted and epoxy coated. 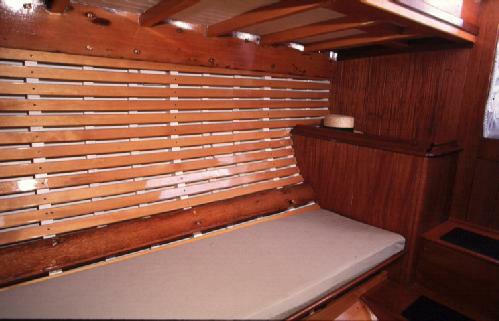 Our scope of work was new interior (cruising) teak deck and fittings , replicate original coachouse and a new rig. 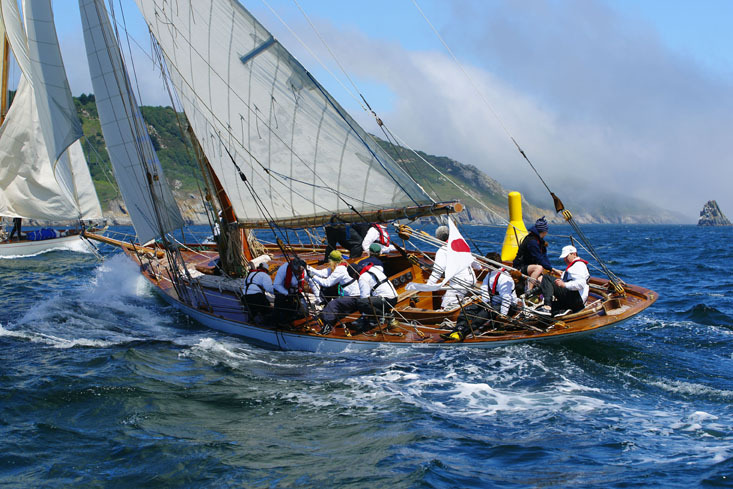 The yacht is now UK based and competes regularly in the classic regattas. 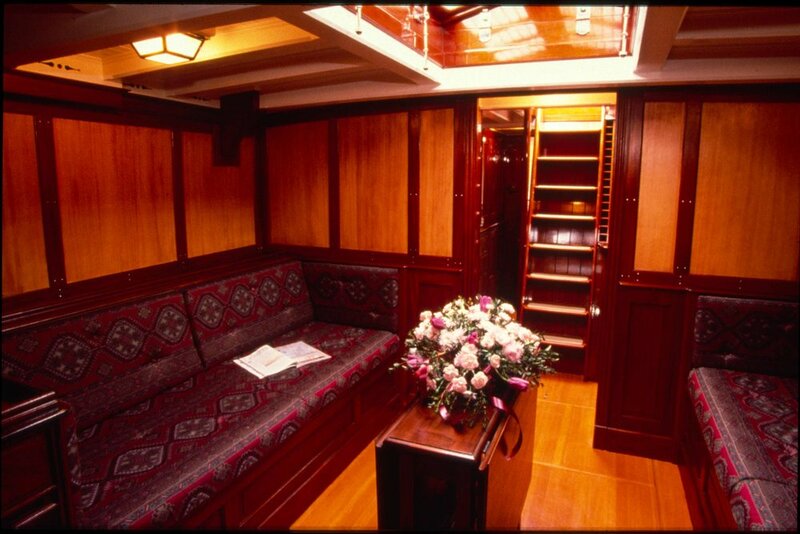 The yacht had undergone a major restoration in 1989/90 at SYS. A few frames replaced, a new saloon sole, rebuild completely the furniture in the aft cabin, returning the layout to the original. The second yacht we took away from Loch Fyne, this time by lorry. The restoration was part complete before we worked on her, sadly we had to go backwards before moving forward, the keel had to come off to deal with some awkward fastenings. New interior with a modern take, complete new tanks and all engineering systems. New deck and fittings. The original rig, although heavy, was still in excellent condition and so reused. 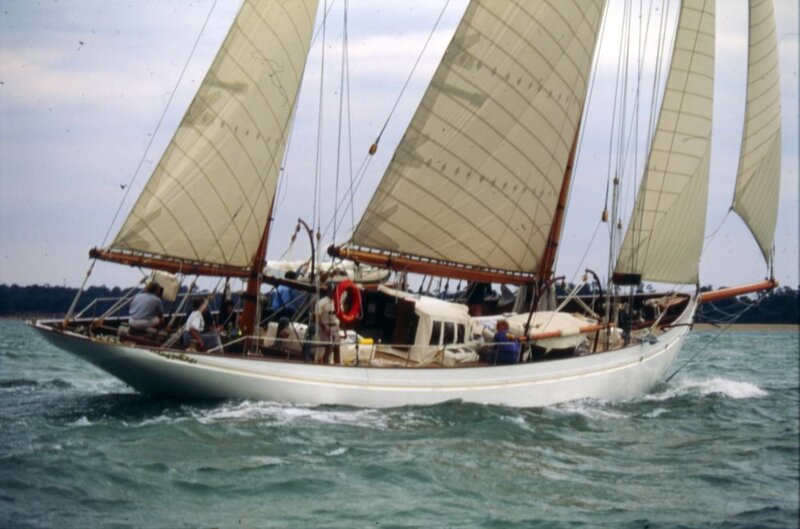 She now lives in the Mediterranean and races in classic regattas. Her current owner acquired her at auction in 1993, Harry Spencer brought his tug and barge up and we lifted her into the barge with a 750 tonne mobile crane. We took her into the Fairlie shed and cut 750 mm of ballast keel off to counter the new engine and generators. A full structural restoration was carried out, utilising the old deck structures which were in fine condition, a new rig was built, new interior, utilising the original doors and frames. The yacht sailed round the world 1999-2004 and now lives in the big shed in Fairlie very close to her birthplace during the winter and cruising every summer. This 8Metre was one of a batch sold to Vancouver and repatriated with Dr. William Collier. Sadly very neglected and suffering from much fresh water damage. Complete structural restoration back to her original spec and rig, the only change an outboard mounted on a removable bracket. She competed very competitively in the Mediterranean under the CIM handicap system. Rescue in this case was sailing her back from Cyprus, water poured in every time we went to windward in any sort of sea. A complete structural restoration took place, our very first as Fairlie. The challenges included fitting in all the new engineering and electric systems and then hiding them from a casual glance. The designs for the rig fittings were based on Altair’s. Since 1995 Tuiga has been the flagship of the yacht club of Monaco.